There aren’t many builders with a strike rate like Pepo Rosell. Since the early days of his Radical Ducati shop, he’s been turning out several sleek, lightweight cafe racers every year. 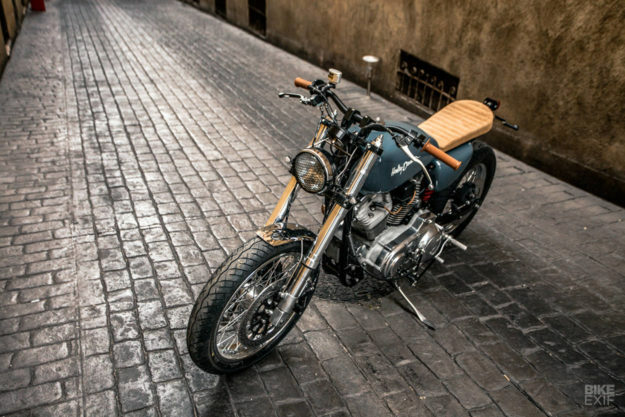 Pepo is not a Harley specialist, though: his favored platforms are more compact and sporty. 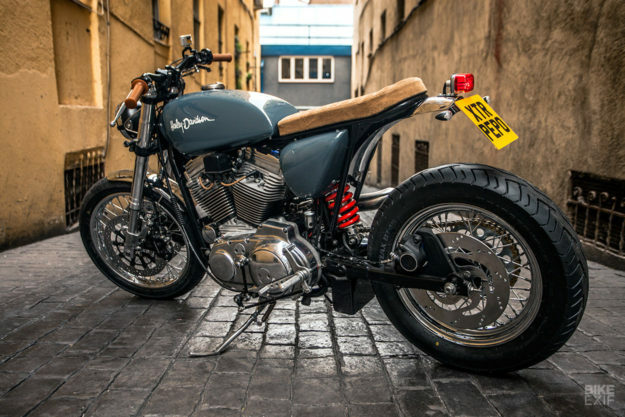 But his Dyna from a couple of years ago made waves, and led to the commission of this extremely rapid Sportster. 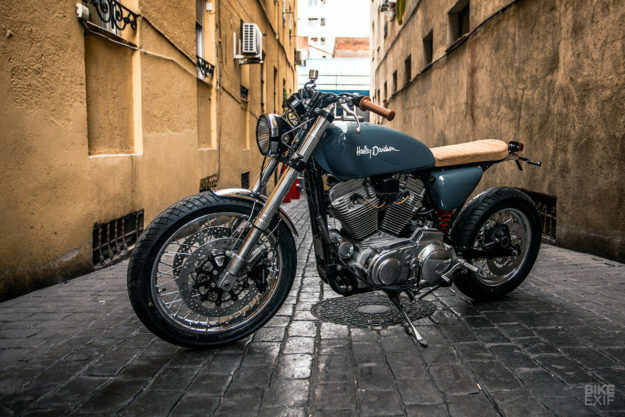 “The call came in from a foreign client,” Pepo tells us, “after he saw my ‘Gabrielle’ Harley Dyna in Bike EXIF.” (Gabrielle made our 2016 Top Ten). Although he’s French by birth, Pepo’s workshop is in Madrid. 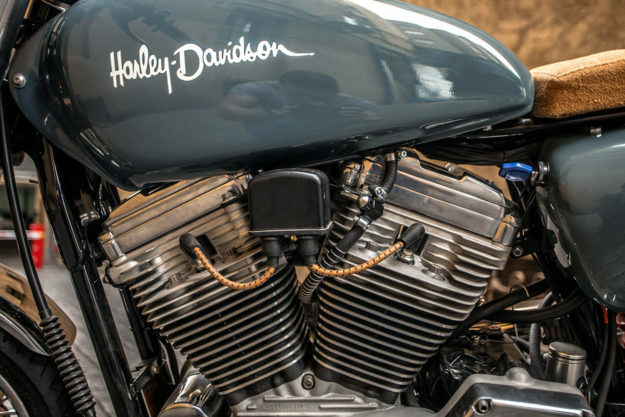 He sourced a clean Sportster locally—a 1992 five-speed XL883 model—and started work on the suspension. Rather than tweak the existing forks, Pepo has taken the nuclear option and installed a set of suspenders from a ’92 Suzuki GSX-R750, complete with its double-disc brake setup. The fresh new rotors are from the Spanish specialist NG, and Pepo has installed a Discacciati radial master cylinder to keep the pressure on—in the best possible way. He’s also modified the hub to make everything fit with an 18-inch front wheel. The rear brakes have been upgraded to match, with a mix of Brembo and NG parts. The lines are a steel-and-Kevlar braid mix supplied by Fren Tubo. The reason for all these upgrades? 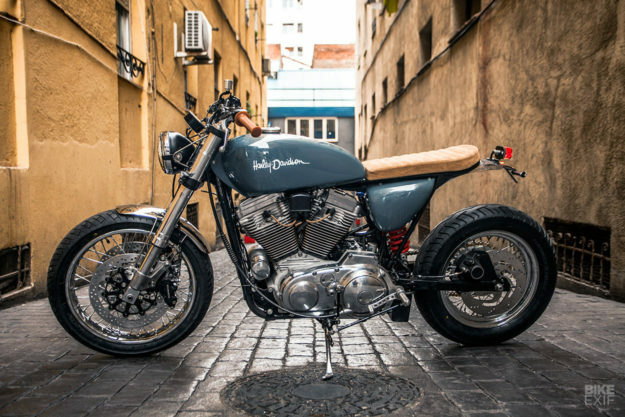 Pepo has woken up the Sportster’s 883 engine and turned it into a powerhouse. 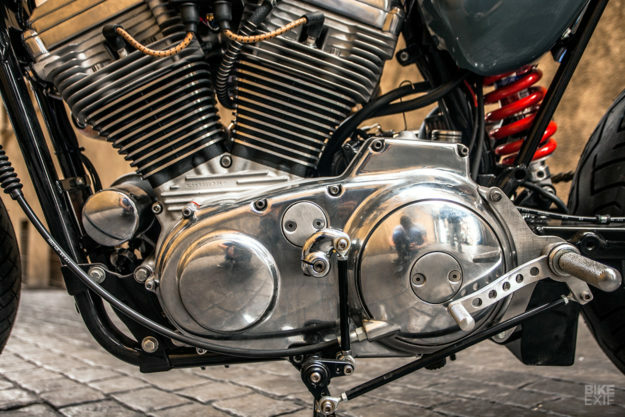 Most Sportster owners will be familiar with 883 to 1200 conversions, which are popular for two reasons: They’re often cheaper than buying a new 1200 model, and you get to keep the 883’s shorter drive ratios—which amplifies the acceleration even more. For even more punch, Pepo has ported the stock heads, and fitted higher compression pistons. An Andrews cam with more duration and lift boosts power throughout the rev range. There’s a Mikuni carb (with Pepo’s own air filter design) for super-crisp response—and a fully custom 2-into-1 exhaust system at the other end, built by Pepo’s in-house fabricator ‘Supermario.’ A Domino quick-open throttle ensures no time is lost when the rider twists the throttle. Power is likely to be comfortably on the right side of 80 horses, and it hits the back wheel via a chain conversion (with a gold Tsubaki chain). 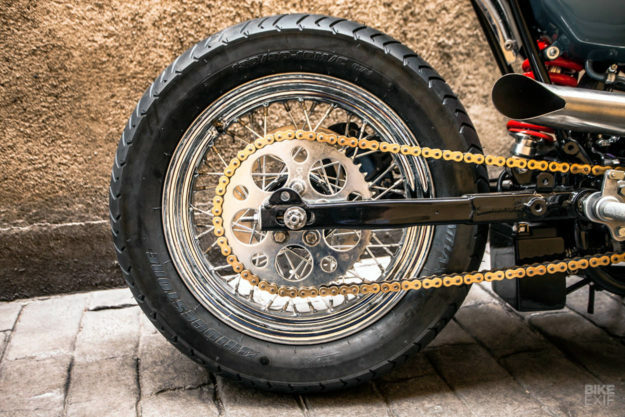 The tires are Bridgestone Battlax BT45s, the perfect compound for older sport bikes. Keeping everything running smoothly is a Screaming Eagle programmable engine control module, with sparks coming from a high-performance coil. There’s new wiring all round, hooked up to a Lithium Polymer battery pack and controlled by Motogadget’s ubiquitous m.unit box. 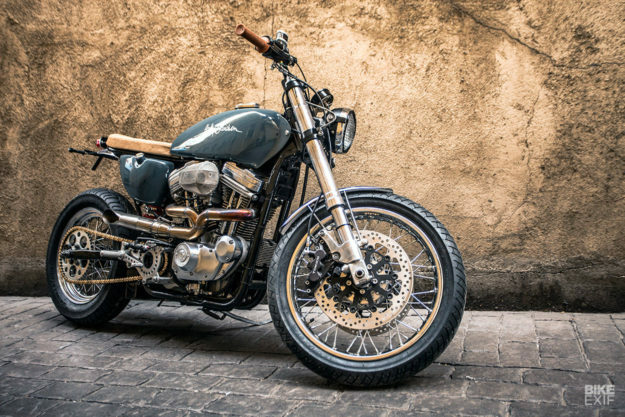 Pepo is a dab hand with custom metalwork, and he hasn’t held back on this Sportster. The frame from the engine backwards is new, and it’s more than your standard cut-and-loop job: it’s part of a monoshock conversion, with a custom-built Hagon shock on damping duties. Underneath the custom seat unit are side panels that originally came from a Triumph Legend TT, again modified to fit—and on the right-hand side, concealing a modified Sportster oil tank. 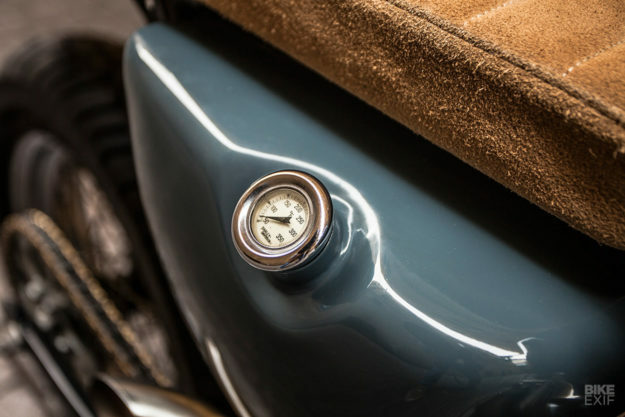 The fenders, footrests and brake lever are all fabricated in-house from aluminum, along with the license plate and headlight brackets. 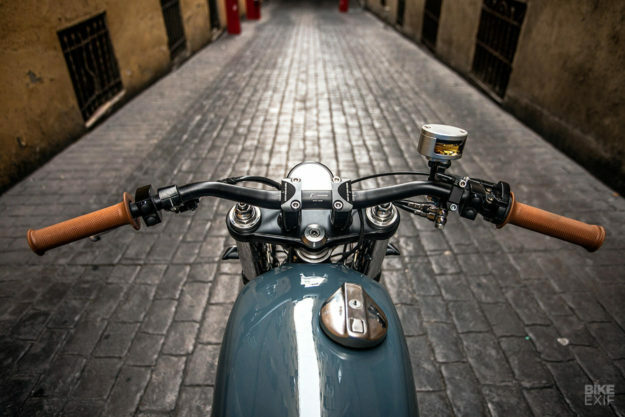 There’s a lamp up front from a Mash 125, a Lucas-style taillight out back, and a custom dashboard housing a Motogadget instrument. Rizoma bars are plugged at each end with natural rubber grips from Gonelli. The paint is just about the only part of this build that Pepo didn’t handle himself. 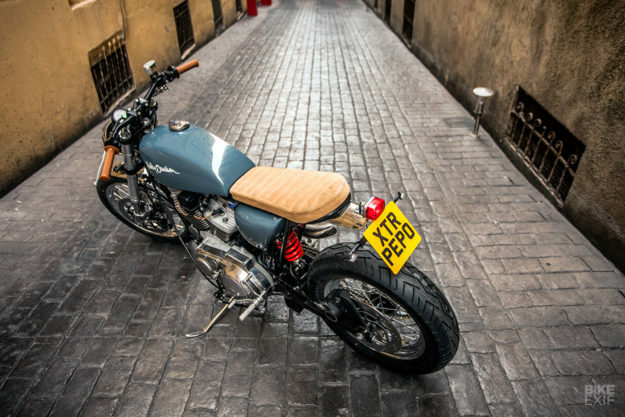 His client chose a warm grey-blue to match the color of a favorite helmet from Les Ateliers Ruby, and it was applied by the Madrid motorcycle paint specialist Artenruta. It’s got to be one of the fastest Sportsters we’ve ever featured on these pages, and it should be equally handy in the twisties too. 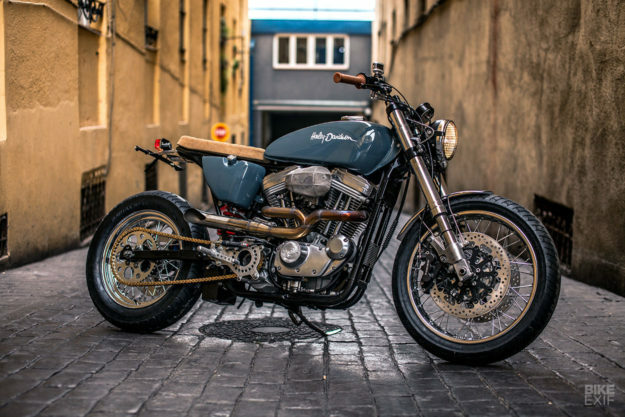 There’s a new Sportster coming soon from the Milwaukee factory, and if Harley are thinking along the same lines as Pepo, they should be on to a winner.